We charged through the alley toward the first barrel when something unexpected happened. Muggy my horse violently turned, bucked and I went flying through the air. In mid flight I tried to keep my hand on the reins but the horse jerked and I watched him hopping away like a grasshopper on steroids. I hit the ground with a thud about the same time Muggy kicked the barrel over. I laid there in pain as Muggy continued his frenzy. Instead of being a barrel race it had turned into a saddle-bronc event, and in this case I had lost miserably. My jeans were torn at the knee and my hat was ten feet from me on the ground. Muggy continued his hysterical dance, reversed direction and headed toward me, hoofs cutting savagely into the ground. My body froze and expecting the worse I tucked my head between my arms. Then I noticed a man vault the fence and in a few quick long strides he took a position between me and Muggy. This unknown stranger raised his hand and I expected him to receive a wild frontal blow from my horse, but with one swift hand he grabbed the reins. With his other he made a strange movement across Muggy’s neck, deflecting the horse’s forward movement. Muggy stopped and the stranger began to gently pat Muggy saying, “Whoa boy, whoa boy,” until the horse calmed. There was something comforting and reassuring in his voice. Then the stranger led Muggy to the guard rail tied the reins and continued talking to the horse. A couple of people ran in my direction but my eyes stayed on the stranger. He had a amazing calming effect on the horse. A flash went through my mind and I wondered if the Horse Whisperer had magically saved my life. “Ah, I think so,” I answered. In reality my hip hurt and I knew I could be stiff for the coming days. I hoped it wouldn’t prevent me from racing tomorrow. A bigger question is what happened to Muggy and would he be okay for the race? Today was practice, tomorrow the real thing. The stranger gave a couple of pats to Muggy and then he turned and walked in my direction. He was tall with broad shoulders. His jeans and boots were worn as well as his plaid long sleeved shirt and cowboy hat. He had a square jaw, was tanned and had happy wrinkles around his eyes. I thought I was looking at the face of the Marlborough Man. I tried to stand up but was wobbly on my feet and the stranger held my arm and helped me get steady. “I can help you Ma’am,” he said. He reached down, retrieved my hat and handed it to me. I put the hat on my head and dusted off my clothing. I limped as we walked toward the horse and I wondered why he had become traumatized so suddenly. I was a member of the Women’s Professional Rodeo Association, or WPRA, the largest women’s professional association in the United States. More specifically I was a barrel racer who had rapidly made my way up the ranks. I lived on a fifty acre ranch in Northern Idaho that has been in my family for almost a hundred years. Four years ago my husband Dan was driving in a snow storm when an overloaded eighteen-wheeler strayed across the center line and killed him on impact. Now I was bringing up two pre-teen boys with the help of my mother. After the accident I went through months of emotional turmoil until I took up one of my teenage hobbies, barrel racing. In three years I went from amateur up to the highest level of the WPRA. Muggy had been with me for those three years and was a force to be reckoned with. He had powerful legs, could turn on a dime and had an exceptional intelligence. More than that he had a will to compete and in my trade that’s what differentiates the winners from the losers. But what happened today was totally out of character for my horse. Tomorrow was the finals of the WPRA championships. The rider with the most prize money at the end of the season is crowned champion and right now I was in third place but within striking distance of number one. I’ve come in first place in the last three WRPA events and I’m convinced that Muggy and I had a good chance to win it all. Now I was not so sure. To win not only means the prize money, but it’s the sponsorships that makes a big difference. Winning the championship would help cover the expenses at the ranch and I would be able to put something aside for college for my two boys. This season I had been on the road a lot and I was thankful that my mom was home to look out for the boys. But at this point Muggy and I were getting tired and perhaps today he was telling me that he had enough. I was sure he wanted to get back to the lush green pastures of Northern Idaho. Or, was there something more to Muggy’s strange behavior? I walked to Muggy, the stranger at my side. “It’s unusual for him to act that way,” I stated, my head still spinning from the fall. “I take it you’re in the competition tomorrow,” he said. “Yes, I’m in third place overall and I was hoping to do well. Now I don’t know.” I paused and looked at the tall stranger. There was something about him. He radiated assurance and made me feel secure. I liked that. He looked at me and said, “My name is Max, Max Burkett. For some reason that name sounded familiar. “I’m Ellen Parker. Are you here to see the barrel race tomorrow?” I asked. I was wondering if he was an official or a spectator. “Do you mind if I take a look?” Max asked. Max undid the cinch and let the saddle drop to the ground. Then he pointed to a bloody spot on Muggy’s back. “It’s not normal,” he said. Then he reached down and flipped the saddle over. On the bottom of the under-pad was a piece of metal. It had the shape of a multi pointed star with sharp points sticking out in all directions. “Oh no, that must have really hurt him,” I exclaimed, understanding why Muggy had been so tormented. “Where did that ugly metal come from?” I asked. “Obviously someone put it there,” Max stated. I immediately wondered who would do such a thing. Could it have been one of the other contestants? I doubted it. Even though we were highly competitive and there were big egos on the line, I didn't think they would do it. Something like this would be highly frowned upon by the WPRA. In fact, abuse of a horse is covered in their rule book. It is massive, over eighty pages and you almost need a lawyer to work through it. If what happened today were to occur during the actual barrel race, I would have been fined from every direction. For instance, I lost my hat when I fell and losing a hat during a barrel race incurs a fine. If a horse poses a danger to anyone, like today, there would be another fine. Riders are restricted strictly to western wear and you could not have holes in your clothing. The rip on the knee of my jeans would not be tolerated. And the rules went on and on. The rules had been put in place since 1949 when the WPRA was first called the Girls Rodeo Association, and the rules had been tested and refined over time. “Who would do this?” I asked. “Why would they do this?” I asked..
“Please call me Ellen,” I stated. I was feeling sore and my nerves were fragile. I didn’t want to take advantage of him but I thought it might be good to have some help. Some of the contestants traveled with an entourage of assistants but I did everything on my own. “That would be very kind of you,” I said. I had been keeping Muggy in a pen next to the small rodeo arena where we were practicing. My camper was nearby at a campground. The finals took place at the large Thomas & Mack Center in Las Vegas where the National Rodeo Association super event was taking place. Max suggested to move Muggy to a larger corral to settle his nerves. With some hesitation, I agreed. Max and I walked Muggy to the corral which turned out to be a half acre of free space. Max put out some feed and the horse went right to it. Max waved back. Several other people walked by us and greeted him. For some reason his name was familiar but I still couldn’t place it. He smiled and I liked his face. He looked like someone who could laugh easily but there was also a quiet seriousness about the man. “Is it safe to leave him here?” I anxiously asked. “That would be very nice,” I said, grateful that the horse was safe and even more grateful that this mystery man would be around tomorrow. I went back to the camp site which was thick with campers and RV’s and went to my pickup truck with the camper on the back. Night was falling and I walked over to a barbeque restaurant, bought a sandwich and took it back to my truck. This was my home away from home. It was small but somehow I’d learned to adapt to it. After eating the sandwich I went to the showers on the campsite and took a long hot shower. My hip was sore and my vertebrae seemed out of line. The hot water felt good on my body and I was glad to be fit and athletic. Somehow that must have helped in taking the fall. I dried myself, dressed and went back to my camper and laid down on my bed, the impressions of the day rushing through my mind. I was feeling after-shock. The mental picture of Muggy bucking across the grounds and the slow motion image of me flying through the air gave me shivers. Why would someone put that sharp metal object under Muggy’s saddle? Then there was the memory of Max running in front of me to stop Muggy from his wild frenzy. That was exceptionally brave or incredibly stupid. Max had this amazing calming effect not only on the horse but also on me and I was touched about his offer to take care of the horse and to stay over for a day to help. But there was something more at play within me. I laid there in my small camper feeling the loneliness that had overcome me so many times since losing Dan. Suddenly out of the blue a forceful wave of pain rolled through me which was much more than the physical pain I felt in my hip, for every inch of my body longed for him. Mixed into the hurt were happy flashes of my lost husband. a lightning bolt images of good memories. Burning tears rolled down my cheeks as I again felt anger that Dan had disappeared from my life from one moment to the next. I had often wondered how God could allow such a thing. Knowing I should be concentrating on tomorrow’s race, it was not helpful to dwell on these memories. Maybe I was feeling weak and vulnerable because of the hard impact of the fall but maybe it was also because of the sudden appearance of Max. His calm strength reminded me of Dan. You stupid woman, I told myself. That is the last thing you need right now to be distracted by a man. You’ve got a race tomorrow. Go to sleep and forget about him. You should know better. During the last three years of travel to all these barrel racing events I had seen many interesting men. Most of the men on the professional rodeo circuit were good guys with solid values. Some had made advances to me but somehow I guarded myself and stayed aloof. There was a mental barrier in me and I didn’t want to open it to a relationship, not wanting ever again to ever feel the pain I felt when losing Dan. Then with one swift move on the rodeo ground, Max had not only stopped my horse but he had entered into my mind and soul. What was it about him? And more than that, who was he? In fact, I wondered how he happened to have been there at the right place at the right time. Did he have a connection to the men who put the metal object under the saddle? Or was it Max himself who put the object there? Now Muggy was at the stockyards but what guarantee was there that he would be safe? Anything could happen. If Max was part of the plot, whatever it was, it would be an ideal place to drug the horse. These thoughts were racing through my mind and it was impossible to sleep. The big question was whether Muggy and I would in sufficient condition to race tomorrow. The race was so important to me. My family needed the money. The following morning I awoke early, nervous about the upcoming barrel race. My head pounded like a sledge hammer. After getting dressed and having something to eat I walked to Muggy’s corral. A truck was parked in front of the gate and a man I didn’t know was standing there. I thanked the man and walked Muggy back to my horse trailer, put him inside and drove to the Thomas & Mack Center. Max was no where to be seen. I parked my truck and trailer in a parking lot reserved for contestants and unloaded Muggy. He seemed more nervous than normal, but so was I. There were more than nineteen thousand people who would be watching the barrel racing event. I led Muggy through security and checked in with event officials. Other riders were there and I knew most of them. We had competed against each other at various events during the past season. We wished one another good luck, but underneath we were a competitive bunch of women. It was fabulous to be participating in this event and adrenalin was racing through my veins. One by one the riders took their turns and I was the third from last to go. Finally my turn came, I mounted Muggy and he nervously pranced in the tunnel that lead to the alley. The objective in barrel racing is to get the horse to full speed before leaving the alley and passing through a timer which we call the electric eye. Then we race around three barrels in a clover leaf pattern before going back through the timer. The best time so far was sixteen point five seconds. I was nervous about Muggy. He was jittery and I had difficulty to control him. When it came our turn, I leaned down whispered in his ear and said, “Let’s do it boy.“ I nudged him with my boots and loosened the reins. Muggy charged forward and I sensed something I hadn’t felt before. 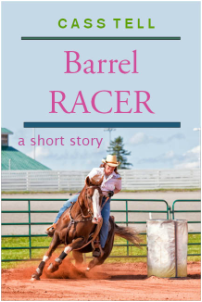 There was an unusual power in the horse as he ran the sixty feet from the start line to the first barrel. He turned around the barrel and I fought to stay on him and within seconds we were hugging the second barrel. By this time the horse and I were moving in perfect unity. The third barrel was a breeze and we charged back across the timer line. I heard the time, fifteen point four seconds. That was the fastest we had ever achieved in a race. A roar of applause came up from the crowd. In anticipation I waited for the final two riders, my heart pounding wildly. Both were above my time. I was now leading the competition. Through the day we went through several rounds and with each one we were improving our time. It was like Muggy had gained new energy. Eeach time we attacked the barrels we were oblivious to the crowd, entirely focused on looping the barrels as fast as physically possible. Our final time was close to the best time ever achieved at the WPRA Las Vegas Finals. Even before the last rider finished I sensed I had won the event and also the national championships. Ecstasy and disbelief fought through my soul. The following hour was like a dream with awards being given, photos taken and many people approaching me to give their congratulations. And, some sponsors gave me their business cards and asked to talk. I didn’t see Max anywhere and I felt a flash of surprise and anger. He said he would be there to help me but he was no where to be found. I shrugged sensing this was just another man you could not count on. My regret was that my two sons and my mom were not there. As soon as I could get away from the crowd I would call them to tell the news. The crowd began to clear from the stands and then I noticed Max walking down the steps of the arena. He waved at me and I waved back. Mixed emotions swept through me, anger because of his absence combined with a surprised pleasure in seeing him. I looked closely at his face and something seemed wrong. His left eye was swollen and there was a gash on his chin. I tied Muggy to the fence and Max walked toward me. I felt shocked. So that explained it. Max was in fact looking out for me. Moving closer to him I saw dried blood on his chin. “You got really hurt,” I exclaimed. “Nah. You should see the other guys. They experienced some cowboy justice.” He laughed. My heart sunk when I saw him walk away. I sensed this was an exceptional man. After he disappeared I looked down at the card. His name and telephone number were on it but also a logo, ’Triple B Ranch’. That struck me. Now I realized who he was. Max Burkett. He owned and ran one of the largest ranches in Montana with thousands of head of cattle. It was known to be very well managed place. Indeed he was a man who knew horses and cows. But, what did he know about families and boys? A week later I was walking from my barn where I had just taken the camper off my truck. The barrel racing season had finished and I was looking forward for some time with my family, although I was worried that I might not be getting much free time. My telephone had been ringing non stop with sponsors wanting me to sign contracts, and to attend promotional events and photo shoots. The additional revenue coming from this would be helpful to cover expenses and my boys’ university costs would be covered. I noticed a large blue pickup truck turn off the main road onto the long road that led up to my house. It came to a stop in front of me. As it approached I saw it had Montana license plates and on the door was painted ‘Triple B Ranch’. My heart began to beat and my hands became sweaty. A man stepped out. It was Max. He wore new jeans and boots, a fresh pressed shirt. He saw me and tipped his new cowboy hat, a big grin on his face. I approached him, hesitated and then gave him hug, our bodies pressing against each other. It had been so long since I had been close to a man. We went into my kitchen and sat at the kitchen table. Once the coffee was ready I poured one cup for Max, black, mine with cream. His hat was on the chair next to him and I noticed that he had wavy dark brown hair with a few specks of gray. “And you drove all the way from Montana for that?” I smiled. My emotions were racing. He wanted to see me! I blushed and looked away so he would not notice. To see him here in my kitchen was unreal. I had thought of him a lot since leaving Las Vegas but didn’t expect to hear from him again, although deep down I wanted to be with him. Now standing in front of him I didn’t know what to say and strangely I felt defensive. “I’m glad you came,” I mumbled at a loss for words, hoping he would not notice. “May I say something personal?” He asked. “Sure,” I responded, knowing that most cowboys were not inclined to talk about personal things. “I’m wondering if I could, ah . . . visit you? I was touched by his honesty and my defensive feelings started to melt. “Yes,” I said, knowing it was time to move beyond the pain of the past. “It’s not easy sometimes,” I quickly replied. Silently I said to myself: this is a man I would like to get to know. We sat there at the table across from each other, silent but communicating. Max reached his hand across the table and held it open. I put my hand in his and I felt his strength, my hand secure in his. It’s what I needed. Six months later I moved with my boys and mom to the Triple B Ranch. My boys are thrilled to be around some exceptionally funny and hard working cow hands. And I’m thrilled to be around one very tough cowboy. Indeed I call him a cowboy in the full respect of the term. It’s strange, but in our modern culture we have gender neutralized everything. But all I can say about Max is that he is a cowboy through and through. And it’s an honor to be married to the man. Sometimes I play the film of these last years in my head, the pain of losing Dan and the loneliness I felt. I had questioned why God had allowed such a thing. I still don’t have all the answers but I guess God loves me after all. The twists and turns of life are mysterious, but through all this one fine man was brought into my life. It seems God’s love had been there all the time. And what about Muggy? He lucked out. He has thousands of acres to roam.